I can’t believe that I’ve already been away from Oregon for a week. As I’m telling my friends back home my experiences, I know that Oregon will always have a place in my heart. My last week at WRCA wrapped up pretty uneventfully, making sure that I put a bow on all of my projects so that they’re easily accessible to those in the future that will use them. Off work, I spent my time saying see you later to the friends that I made, and trying to cram all of the stuff that I had acquired into my suitcase. 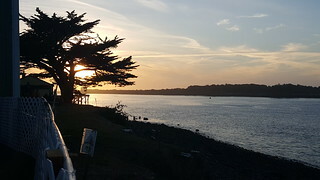 I tasted the famous Denny’s Pizza in Coquille (still the best pizza ever) again, and I tried out a few local hotspots that I had been wanting to try – Edgewaters (I tried Halibut for the first time! 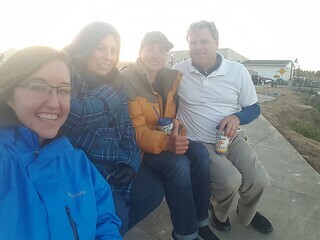 ), Coastal Mist (delicious chocolate company, where you can get their awesome chocolate mixed with coffee for a great mocha), and Broken Anchor (a local bar & grill favorite, where I learned how to play shuffleboard for the first time). I walked all around Bandon and visited their cute artisan stores, finally settling on my favorite sea-glass necklace (made my Sally, who also sells seashells on the Port of Bandon, a.k.a. the Sea Shore). I learned a lot about development efforts in the rural United States, and I’ve already been able to use this knowledge in a few of my classes in the first week of school. But most importantly, Oregon taught me most about who I am – in the quiet summer, humbled by the giant trees, listening to the sea breeze, I looked inside and was really able to discover who I am, critically reflect on my career path, and determine where I want to go in the future. One of my goals of the summer was to “find peace” –- to learn how to focus my mind and energy and determine what activities allow me to be the most peaceful and productive. I believe I’ve found just that, and it’s allowed me to settle into my school year, with my sights on my senior projects, making new friends, and applying to graduate school. I cannot thank enough Oregon Sea Grant, Oregon State, WRCA, and everyone involved in the programs for selecting me to receive this invaluable experience. Thanks to those who mentored me along the way, and for all that you’ve taught and shown me. I will be forever grateful. 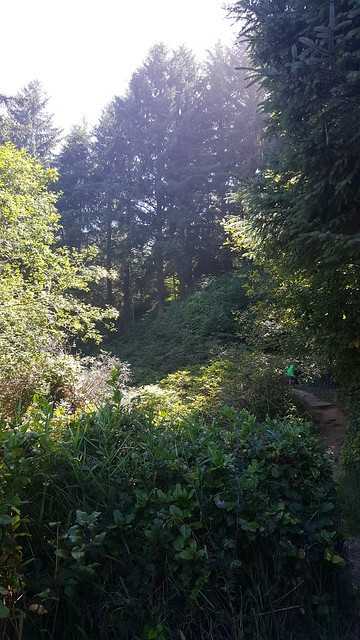 I know that it is not a goodbye to Oregon – I am already planning my next trip up. See you soon! We just wrapped up our second-to-last week as Summer Sea Scholars, culminating in the final science symposium. We’ve been preparing for both our final presentations and our posters for most of the summer, but I felt like I had been preparing for most of my life. Let me explain. Most of my summer I’ve debating the question, “To go to grad school now or to not go to grad school now?” But more importantly, “What do I want to do with my life? What do I see myself becoming?” I thought that I should figure that out before applying to (most likely very expensive) graduate school. After all, isn’t grad school supposed to prepare you for what you want to be? How could I enroll in something that prepares me for an unknown end goal? When I told my advisor that I wanted to be a professor, he responded, “Well, you certainly have the brains for it.” This amazed me; he had only witnessed a semester’s worth of my research capabilities, and he whole-heartedly believed that I could have a career in research and teaching others to do the same. Later he cautioned me when looking at my 4-year undergrad plan, worried that I may experience “burn-out” if I went straight to grad school. He had seen quite a few people that simply got bogged down with the research after being in school for so long, and they never finished. He doesn’t want the same for me. And so that brought me to this summer, where I tried to picture myself in the future. While there were quite a few positions where I think I would be happy, I truly believe that I’ll be the happiest as a professor. But it was still hard to truly know that I would love that position without actually being immersed in the workload. Spending my time looking through GRE vocab cards and taking practice exams, I want to make sure that my time is well spent, especially since I’m making the decision to steer my life in this direction – not just studying for the GRE, but applying to graduate school and scholarships, attending 5-7+ more years of school … a huge time commitment that could be spent doing so many different things. I needed a sign to make sure that this was really what I wanted to spend my life doing. Fast forward to this past week, where I spent most of my time preparing my speech – writing, practicing, cutting, and repeating, until I got to one final polished piece that I was immensely proud of – it was clear, concise, and discussed all of the most important information of my summer research. Nonetheless, I was really still nervous before I presented. When Haley was introducing me, I checked my pulse – incredibly fast and completely erratic. A few more advice-givers came to mind, “Think of it as a conversation,” one of my best friends told me once, “You are just telling the audience a story, so act like you’re just telling me something that you find fascinating;” This, along with Collin’s advice to play a cool catchy song before presenting, helped me to stroll to the front of the room with “Sunglasses at Night” strumming in my head. Timing out my presentation also helped, as I was able to check my watch, to watch my pace. 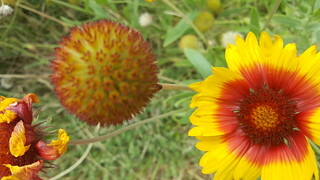 I also reminded myself to breathe – this helped with pauses. So that’s what I did, I talked like I was having a conversation with a group of people. It honestly surprised me how engaged they were – the questions that were asked were spot-on bits of information that I pulled from my presentation for time-sake – it was like I planted them in the audience! But it demonstrated just how much they were listening, like in a (good) conversation. The poster fair was no different, with more people introducing themselves and asking me more of what I wished I had been able to cover in my presentation, and I was immensely grateful to be able to continue the discussion. I was surprised on multiple fronts – I was surprised at how interested everyone in the audience was in my topic. I was surprised at how I was able to convey the information that I wanted, and engage them in a way that they could follow (I typically speak at a million miles an hour, jump around, and lose everyone). I was surprised by how much I thoroughly enjoyed answering questions that I knew about from my research, and I was the most surprised/fulfilled when someone asked me questions about my research that I hadn’t considered. Their fresh perspectives helped me to be more curious about new and different aspects of my projects. Wow. But, above all, I got my sign. This short afternoon experience offered me the insight that I was hoping for. If the life of a professor is spent researching, [also in meetings and more meetings], engaging others, and constantly being inspired to new research, then I am incredibly excited for my life to come (and for moments like these that I’m sure I will continue to experience throughout my life – the great thing about learning is that it happens everywhere). Current plan? Apply to grad school, with my experience in hand, my end-goal in sight, and the passion in my heart, leading me and fulfilling me as I engage with my colleagues and fellow students everyday. Thanks so much to all of those in Oregon Sea Grant who selected me to take part in this amazing opportunity, allowing me insight into my career, and setting me on this path towards my exciting future. With just a few weeks left and after completing the first draft of my second project (the Rural Tourism Studio) I began my final project – updating the Orb. The Orb is a platform that can used by businesses, communities, or individuals to upload their content to share online. They simply have to create an account, be approved, and start uploading their information. Although it is currently just updated by some Destination Marketing Organizations (DMOs) and a few statewide groups, the aim of the Orb is to allow anyone to be able to share information about local deals, lodging, events, attractions, or photographs for any place in Oregon. 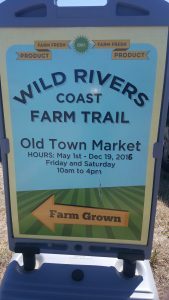 One of the products of the Rural Tourism Studio – now the produce sold at Bandon farmers market is a part of a network of local farmers that make up the Wild Rivers Coast farm trail. This creates “a centralized collection of data of all the tourism assets in the state…” (Davidson 2016) that is then shared onto the Travel Oregon family of websites, mobile apps, and many other locations. It allows smaller, community events to be easily showcased to the world, to “Tell the Oregon story” and make it easier than ever to attract locals and visitors alike. For my third project, I am updating the datasheet of the Wild Rivers Coast, which includes the coastal towns from Bandon to Brookings. I am now making sure that the existing information on lodging, deals, and attractions in the region is to up-to-date, allowing more visitors to take advantage of the regional assets. 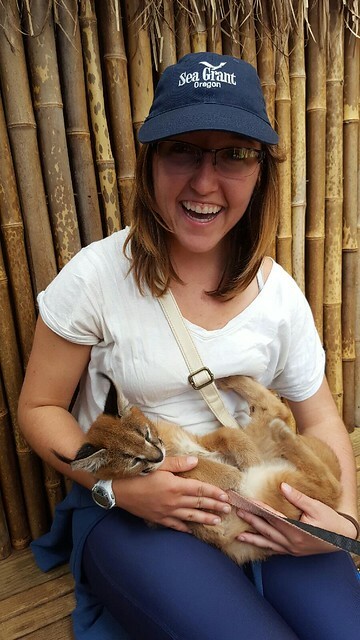 This past week I also got to check out a few neat places close to Bandon, such as the West Coast Game Park Safari, a walk-through Safari where I got to hold a baby Bobcat and Caracal! They also had some large cats, like snow leopards, tigers, and panthers. 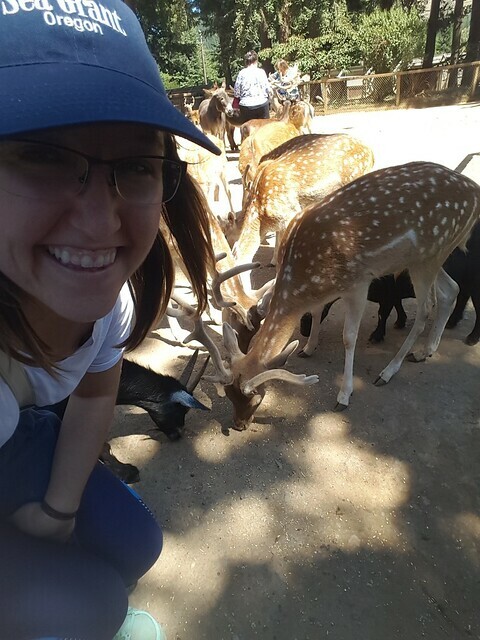 One of my favorite parts (aside from holding baby animals, which is always awesome), was the free roaming deer. They were Mediterranean/European deer, and many had very large antlers. Although having such large antlers walking towards me was intimidating at first, all of the deer were super friendly (probably because they hoped that I had food for them). Some of them were also trying to get rid of the felt on their antlers, so they were as happy as a dog being scratched behind the ears to be pet! The projects for Oregon Sea Grant are winding down, and I’m getting ready to jump into my own projects for my senior year – pretty exciting! Final presentations on Friday! Stay tuned! This week I was able to complete the first draft of my second project – an executive summary of the Rural Tourism Studio. I talked more in detail about the program in my post last week, but it is basically a workshop series that is provided by Travel Oregon to help promote tourism in rural Oregonian communities. The Wild Rivers Coast (a region from Bandon to Brookings) had their own workshop series and quite a few products have come about since the workshops. I summarized the program and its results as a sort of reassessment to help to move the project forward and continue developing tourism. First, I think that as students at a university, we can often feel helpless when it comes to big issues like fixing the Wi-Fi or trying to have better food. We can feel like our voice or concern is isolated, or that administration won’t listen because “everyone in every college thinks the food can get better” and that our thoughts will be diminished and we’re scared that we’ll be shut down. So a lack of confidence to believe that the concern is large enough to be addressed is likely the first initial barrier to solving problems. To overcome this, one solution may be that one person or some people should have the courage to realize that their thoughts and opinions have value, and that they should be recognized and reflected upon. In lines with this, I’ve also noticed in SGA that some people are reluctant to be that person, as they feel that the burden of completing the task in its entirety will fall solely upon them. Committees can help to share the work so that the task load doesn’t seem to be so heavy, but it still takes one person to say, “Hey, this is a big problem that ought to be addressed, we ought to form a committee” and divvy up the tasks accordingly. Another reoccurring problem I noticed throughout the minutes, and is definitely reflected in a student organization is the high turnover rate of members. Organizations find themselves starting anew with each new board, or progress can be slowed while trying to transition in new members. A potential solution may be to have a person in that organization that keeps up with products or processes, similar to the “our work” link often found on organizational websites. Alternatively, someone could go through a reassessment, similar to my work with RTS. This could decrease the needed transition time for new members by letting them know where the progress on current projects. I also read in a few minutes how a few members would bring up a potential solution to a problem, but it was never delved into, and was glossed over within the tasks of the larger meeting agenda. A few moments of exploration within the meeting could also help to resolve ongoing concerns. Most on-campus organizations usually have a secretary that is responsible for note taking at meetings and/or sending out emails about the meetings and events, but perhaps there is room for a person that actively goes through records to determine ongoing problems, as well as all relative discussion surrounding that particular issue. I’m not exactly sure that this position would look like, but I think it would definitely help with some of the student concerns that we hear in Student Government. I’m sure that there are tons of books written on organizational structures and effective communication for productive problem-solving, but these are just a few similarities that I’ve seen throughout my variety of experiences that I have reflected upon to improve my own organizational management throughout my career. This past week was filled with familiar places and faces, as I journeyed back home for a conference. In my travels I also began my new project for the Wild Rivers Coast Alliance, on the Rural Tourism Studio (RTS). The Rural Tourism Studio is this neat program created by Travel Oregon to promote sustainable development in rural Oregon through tourism. RTS is essentially a series of workshops facilitated by a Travel Oregon Consultant, along with a steering committee of community members from that region. 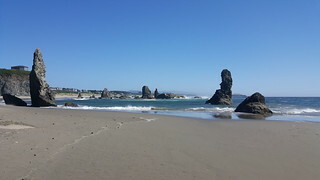 The region I’m working with is called “The Wild Rivers Coast”, which extends from Bandon, south until the California Border (Brookings, Oregon), getting it’s name from the plethora of rivers in the region that run into the sea. Once the region has been selected to be a part of RTS, a committee is formed to help determine exactly what each workshop will cover, specific to the region, to help get the most out of the sessions. 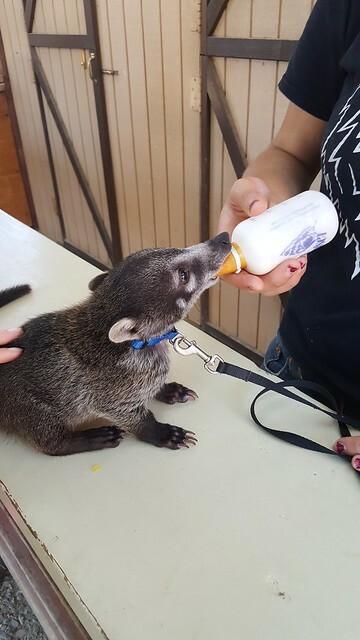 There are then about 8 workshops, where any community member is invited to attend – restaurant owners, entrepreneurs, farmers, conservationists, and anyone is interested in learning how to best attract visitors to the region, or has a stake in the process. The RTS for the Wild Rivers Coast took place from October 2013 to January 2014, so I’ll be researching and compiling a summary about what took place in the workshops, and any progress that has been made since. I’ll then be able to give this information to the new tourism professor at OSU to help with the program and curriculum. 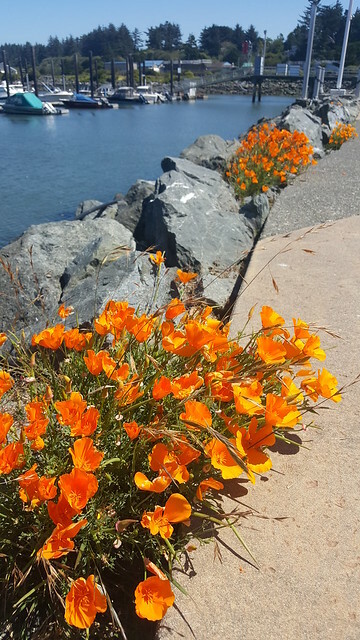 Pictured: Some beautiful wildflowers spotted at the Hatfield Marine Science Center. On the eventful side of things, it was refreshing to be back home in familiar territory, and all flights and travel went smoothly. It was also really great to drive my car again – I’m loving my sustainable low-carbon-footprint in Oregon, but it was nice to have a set of keys too. In Missouri I was able to see my much missed family, and drive down to my college town to see some great friends as well. 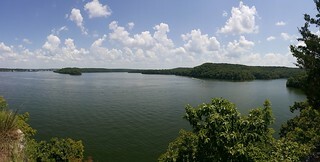 Below is a picture of a hike I took while back home, at the Lake of the Ozarks. My mandatory scholarship workshop was for the Hagan Scholarship Foundation – an incredible scholarship that you should definitely look up if you’re a senior high school student from the rural Midwest (a niche group, yet still…) Part of the requirements is the workshop every summer, where Mr. Dan Hagan teaches about financial security and investing. He made quite a bit of his money by investing in stocks – but not the quick and risky buy low, watch the market, sell in a couple weeks and hopefully not lose any money type of investing. He “Market Value” invests, where you research the best, most stable companies that are likely to continue growing for 20+ years. You invest a bit, and then you let “the magic of compound interest” and “the rule of 72” create your retirement funds for you. We’re given a Schwab account, and so far just about every scholar has been successful. I’d love to talk to anyone interested about what I’ve learned so far, because I’m so grateful for the opportunity to invest and learn, and when you get out of the financial jargon, investing is actually pretty fun and interesting. 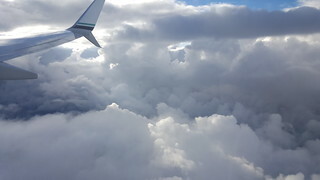 Pictured: The return flight and incredible clouds. But not nearly as interesting as sustainable development. Looking forward to getting back to the South Coast and continue learning about RTS and eco-tourism. Thanks for reading! The week leading up to the check-in was pretty exciting, culminating in the much-anticipated mid-summer presentations in Newport and preceding camping trip. I compiled all of my research on the Oregon Coast Trail (OCT), which I’ve spent most of the summer researching. 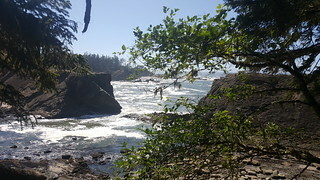 The OCT, as the name suggests, is a trail that runs all along the 360ish miles of the Oregon Coast. This is made possible by Oregon’s “Beach Bill” which made all beaches, all the way up to the vegetation line, public access, so anyone could theoretically walk the entire coast. However, there are some portions of the coast where walking is impossible, as cliffs jut into the sea and there is no walkable coast. My first project concerned researching all of the areas where this occurred, along with areas where pedestrians have to come inland to cross bridges (due to rivers and bays), and any other reason that would take coast-walkers off of the coast. I’m excited to see how the trail progresses from the information of my summary. Thursday afternoon I was able to ride up with another summer scholar up the South Coast to Newport. 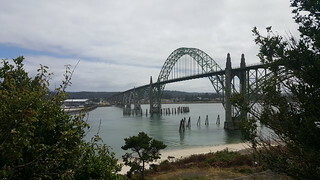 Since my first project for Wild Rivers Coast Alliance (my host for this summer) concerned researching the OCT, I was excited to see a lot of the places that I’ve seen throughout my research as we drove along highway 101.This also helped me to spot out a few of the areas on the OCT that are problematic, such as the Newport Bridge below, which crosses Yaquina Bay. If hikers are unable to get a ferry across the bay, the only passage is the bridge, which has a narrow pedestrian crossing. Friday morning we had our mid-summer presentations, I was a bit nervous for mine, since there was a bit more background that needed to be explained before I actually discussed my projects (how a golf course, Bandon Dunes, fit in with sustainability for example). I felt much better after spotting these amazing artistic puns, however. Then we went camping! After some of the best curry I’ve had a long time at the cute little Thai restaurant on the port in Newport, we drove into the Willamette National Forest. I could go on and on about how much I love the trees of the Pacific Northwest, but I’ll show some photos instead. We were also to enjoy these arboreal giants on our hike to Tamolitch (Blue) Pool, about a 5 mile hike along the McKenzie River, ending where the river escapes under a cliff. The (amazing) coloration of the river is caused by its subterranean passage before we see the water peak back out at the pool. 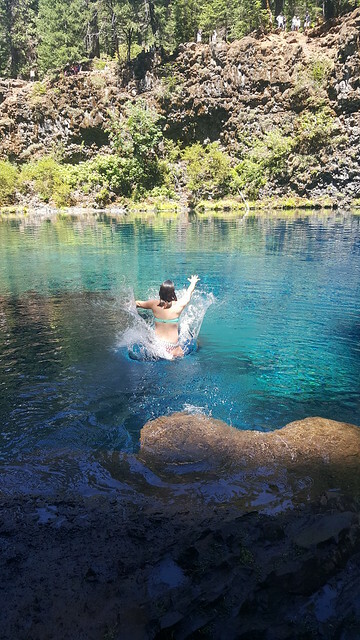 The cold temperatures (about 38 degrees F) and the lack of sunlight is pretty inhabitable for most organisms, leaving behind crystal clear water. What do you do when you run across icy-cold water in the middle of the forest? Well, you jump in, of course! The water chills you to the bones, but it’s extremely refreshing, and a very cool experience. Thanks so much to Haley, our coordinator, for planning this out and taking us there! Leaving the hike Saturday, I rode back to Corvallis with Haley, Ed, and Skyler, just in time to catch a shuttle to my flight back home for the next week (a way better alternative than the 2 buses and taxis mentioned in my first blog post). Thanks for reading, and stay tuned! There are 11 lighthouses are the Oregon Coast, reminiscent of Oregon’s rich and long history as a haven for sailors and fishermen alike. 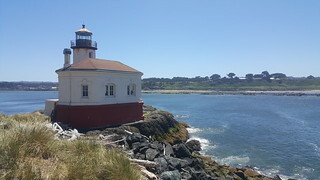 The youngest of these lighthouses is the Coquille River lighthouse, constructed in 1891. 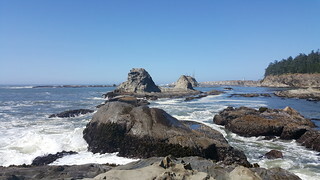 It’s located in Bandon by the north jetty of the Coquille River, in Bullard’s Beach State Park. The lighthouse is open to the public, and there I learned about the hard life of a lighthouse keeper. I tried to imagine the days before electricity, when the lives of sailors depended on one man walking miles in a storm to remain awake and alone throughout the night to shine a light out to sea, and guide sailors to safe harbor. Walking down the north jetty by the lighthouse, I looked up to see a very curious Harbor Seal staring straight at me, about 100 yards away. He was really loving the wave action that day – he made loops out to sea, down back to the beach, and back across to the rocks where I was sitting. I watched him for a while, thinking how cool it was that this was his home and how much I wanted to make sure that I did something to conserve these waters to make sure that he, and all other marine organisms, could enjoy their waves. 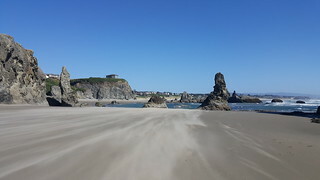 In Bandon, Face Rock, which is just to the right of the pictured photos, is one of the famous sea stacks. I’m hoping to catch this beauty at sunrise or sunset before I leave. they also have the Mill Casino on the bay, where they had an incredible fireworks display on the 3rd of July. I think just about the whole town came down to see the show, and so it was incredible to see people hanging out, playing Corn Hole (very popular here), or throwing a football. Neighborhoods all around the Bay set off a few fireworks too, making for a spectacular light show. The actual 4th was, amazingly, even more incredible than the fireworks at the Mill. Bandon had an all-day music festival set up downtown by the dock. There were over 6 bands that ranged from “Irish Reggae Folk” to “Gypsy Jazz”. 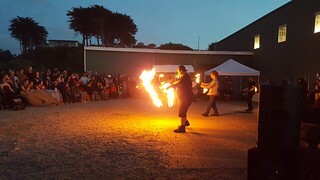 We enjoyed walking around the cute artsy stores downtown, Ice Cream from Face Rock Creamery, and when it began to get dark, they even had a fire dancing show. 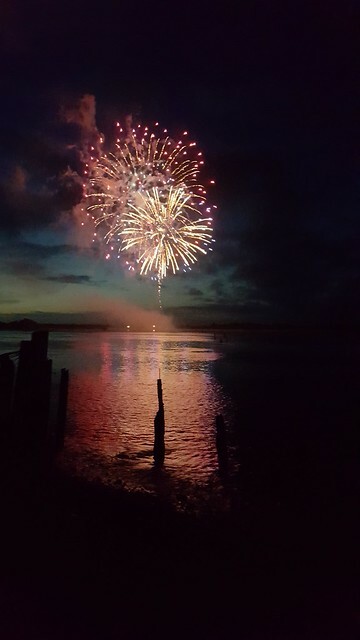 It was probably some of the coolest fireworks I’ve ever seen, as the sunset turned into the firework display over the ocean. While Bandon seems like a little blip on the map, this tiny town has a lot to offer. I’ve been meeting super nice people every day, and I definitely know that I’m going to miss exploring the town and seeing the magnificent wildlife and sea stacks. I think I’m settled in on the Oregon South Coast – finally had time to unpack my bags and live that relaxing way of life that this region is known for! Throughout this relaxation, I’ve been able to focus on my goals of the summer. One of my favorite aspects about Oregon Sea Grant is that they’re interested in our development, not just professionally, but personally as well. One way that they have encouraged us to make the most of our time and experiences here is by setting S.M.A.R.T. goals, standing for Specific, Measurable, Achievable, Realistic, and Time-bound. I love goals. I make a goals/to-do list just about every day, but I had never heard of SMART goals before. I think they’re a great way to reach your end goal by focusing on bite-sized, manageable tasks every day. I also think that the best way to reach your goals is by shouting them to the world, and telling anyone who will listen. Even if they’re not too interested, talking about them is an easy way to keep you accountable to yourself. And so, here is my favorite personal goal that I made, and here is me shouting it to the world: “Determine how to focus my mind and energy to be my most peaceful, healthy, and productive self.” This is basically my way of saying “determine what makes me happy (including what attempts to take away my happiness) and brings me peace”. One way that I’m doing this is by taking an hour a day to do something that I enjoy, be it drinking coffee and listening to music, sitting outside, walking on the beach, running, yoga, or playing golf. I’ve been finding the activities that I enjoy the most, and when it comes time for researching for my senior project or studying for the GRE, I’ve noticed that I’m more relaxed and that those activities are more enjoyable as well. I’ve also been finding happiness in unexpected places, like the fresh morning air on my bike rides to work, or having all of my laundry done and my bed made. Maybe this is what growing up feels like? Never thought that my internship experience would include finding myself giddy over clean dishes, but I’m really glad that I’ve been able to take the time for personal growth and reflection. I think that these realizations will be extremely beneficial for my senior year, graduate school, career, and personal life moving forward. 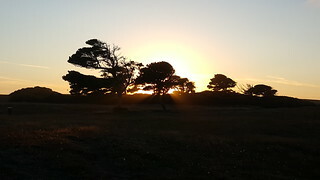 I definitely see an upward trajectory, and I’m grateful for the South Coast for giving me this peace of mind. 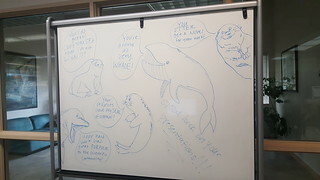 My first week as an Oregon State Summer Sea Scholar has been busy, but already fulfilling. It’s impossible to document every experience that I’ve had, but looking back on my week, there are several moments that stand out. I’ll organize the post by these moments, and hopefully this will make it easier for you to read too – you can skip the less intriguing subtitles. I’m almost embarrassed to say that I didn’t know much about this region, or Oregon generally before I had arrived. 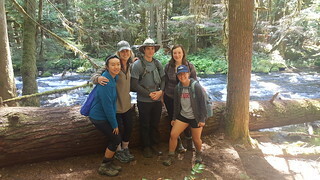 My academic interests surround environmental policy, and I’ve studied Oregon’s history within (really, initiators of) the U.S. environmental movement, and many of their successful environmental policies are fascinating, so I wanted to learn about these aspects on the ground. But my academic research on the histories and policies of the region failed to prepare for the cultural and geographic differences from my Mid-West home. Flying in, I had no idea that there were so many mountains here! I knew about Mt. Hood, and the mountains in Washington, but mountains, a coast, and a seasonal in-land climate? Oregon, you cool. I also expected just about everyone to be wearing flannel, skinny jeans, and thick-rimmed glasses, but I don’t think I saw a one! There were plenty of Starbucks in the airport, though, and I haven’t had a shortage of coffee while here, so that expectation was met. Also no one told me how cold it was; coming from Missouri, our summers are 100 degrees and humid, but here? Highs of 65 and breezy? I can see why Nike set up shop, you can run forever! Also these trees. Man, the trees! Gorgeous conifers, towering over 70 ft! I thought just the Redwoods (which, I also got to see a “baby” Redwood on the OSU campus) could grow this tall, but their average tree here is a giant. Really helps put the world in perspective biking among this giants to work. Speaking of biking, that brings me to my first story. So I had just arrived at my new place (also gorgeous, by-the-way — huge ceilings, two stories, queen bed with my own private bath — definitely didn’t expect any of that. Oh, also laundry is right-next-door and I have yet to see anyone else in there), and I was about ready to take my requisite daily nap, when it occurred to me that I had absolutely no food. 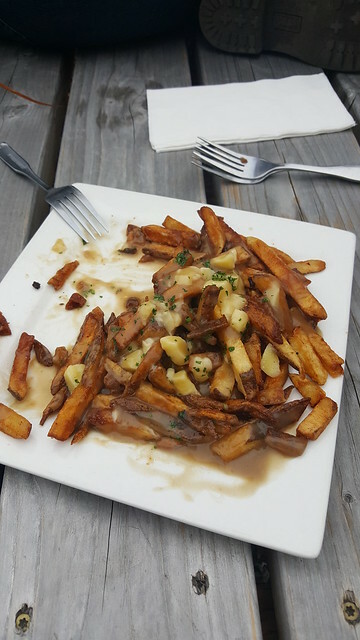 While I wasn’t hungry then, I reasoned that by the time I woke up, biked the 10 mile roundtrip to town, and fixed my dinner, it’d be too late. Talking myself out of my nap (very hard to do), I took off down the road I was told led to Bandon (there’s only one road…). I didn’t get very far when I noticed that the seat on the bike that was donated (thanks a million, OSU!) was a bit too high (surprise, I’m really short). I bent down and realized that the only way to move the seat was with a wrench. So I piddle-paddled-peddled on down to town, choosing between bruising my tailbone and getting poked in the rear with the seat (a difficult decision). After a couple of stores, a lady (in a pharmacy, no less), directed me towards the section that included a wrench, wahlah! She was very surprised by how excited I was to find and purchase such a strange item, and so I explained my long and arduous journey. She laughed and said, “Well now you can add a wrench to your toolbox.” “Great,” I replied, “it will include one wrench.” But it was a wrench that I was able to comfortably peddle on back to my house (with some yummy groceries that I was also very excited for upon returning). 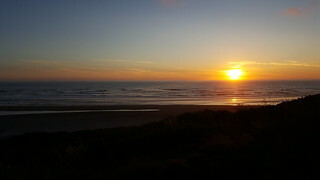 Wow, is Bandon Dunes stunning (photos linked). I had looked up photos before coming, but nothing compared to standing out on the course, warmed by the sun, cooled by the ocean breeze, and in awe as these elements played with the seemingly-endless rolling hills, unbelievably tall trees, and sparkling sand dunes. When I first saw Bandon Dunes, it felt like I was in a dream. Every morning biking to work, it still takes my breath away as I roll through the forest, come down the hill into the resort, and its vast beauty strikes me again. Best perk: I can walk amongst this beauty during my lunch break (see photos from my lunch spot, and a few great trails that I’ve visited). For the actual “work”, I get to do what I love, research, for a cause I support. 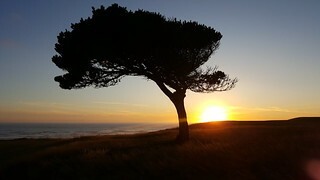 A bit on Wild Rivers Coast Alliance (WRCA) – they’re a local non-profit that is funded by the proceeds from Bandon Preserve, a 13-hole, 3-par course open to anyone at a much lower cost than the other courses at Bandon Dunes. Mike Keiser, the visionary, creator, and owner of Bandon Dunes, created WRCA to help give back to the community. We work with local businesses, other non-profits, and the state to fund projects that meet the “triple-bottom-line” of conservation, community, and economy. We help the south coast develop sustainably, which are exactly my academic interests. My job? Provide information to make this happen. 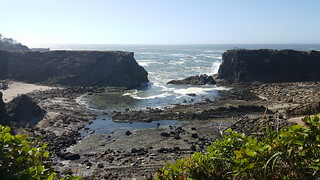 Currently I’m working on a report of the Oregon Coast Trail that I’ll provide to Travel Oregon on how to increase the accessibility of the trail, while protecting the ecosystem that it runs though. Later, I’ll be compiling data on the tourism initiatives in the region to help develop curriculum for Oregon State’s new tourism program. I’ll also get to work with a fantastic local organization called “Washed Ashore”, which collects local sea debris and turns it into art, and then a conversation about the effects of sea litter on our ecosystems (see photo of “Henry the Fish” who lives in downtown Bandon). Basically, this position is perfect. It’s like no other “job” I’ve had before because it doesn’t feel like a job. Every day I am excited to show up and learn as much as possible to support such a great cause. Thank you to everyone who has helped to make this organization, and I am so grateful to be a part of the team. When I envisioned Oregon before my arrival, I guess I basically thought that it would be Portland all across the state… that’s a bad assumption. But with that assumption I also thought that I would be just fine trying to navigate around with just a bike. Oregon is bike-friendly, right? Sort of. 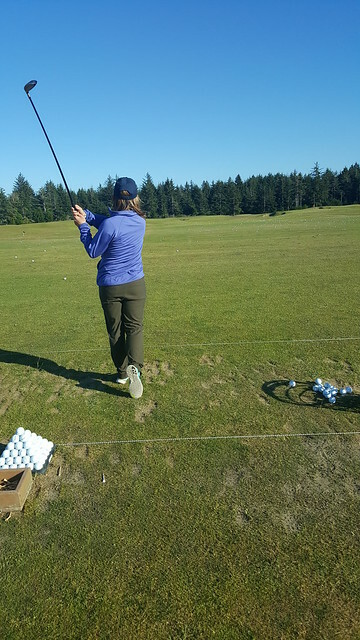 What I didn’t realize was just how small Bandon is (the town where my program is), and just how far away it is from everything else (even my office is 2 miles from where I live, so I’m getting into some decent shape, whether I want to or not). I’ve also been lucky enough to receive a scholarship for my tuition. I’m truly grateful, but one of a few stipulations of the scholarship is that I have to attend a workshop in the middle of the summer, meaning that I had to determine how to get from Bandon to KC and back again as quickly as possible. For my Missouri friends, I likened this task to trying to get from Camdenton (similar to Bandon) to either Springfield (like Eugene, has a smaller airport) or Kansas City (like Portland, large-ish airport with more options, but much farther away) with only a bike. Now, I lived in Camdenton for over 5 years, and I wouldn’t be able to tell someone how to do that. Do they have an Amtrak? I’m pretty sure there’s an Amtrak from Jeff City to KC, but how would you get to Jeff? Local bus from Osage Beach? And then I’m not sure if there’s a local bus from Camdenton to Osage Beach? My point is, I’ve learned what I didn’t know about myself growing up in a small town – we don’t take public transportation, because there basically isn’t any. If you live in a small town, chances are you have to commute to a larger town for most things, and so you’ll need a car, which I’m running short on. So after many conversations (a lot very similar to my description of transportation in rural Missouri), lots of google searches, and tremendous help from my travel enthusiast/saint of a grandmother, I found a route that includes a couple 30-min taxis, 2 greyhound buses, two flights, including the “red-eye” flight (1 am departure) from Las Vegas into KC, and finally a 3-hr drive to my workshop in Columbia, MO. That’s the trip out, I’m still working on getting back in since I just found out that there are no buses back to Bandon on Saturdays. I’ll keep you posted. If you’re still reading, (thanks! ), you’re probably wondering about several aspects of my experience that I haven’t mentioned. This certainly isn’t close to everything that I have to talk about, including my roommates, workmates, and the wonderful people I’ve met around Bandon so far. But I’m sure I’ll fill in the gaps as the weeks progress and I continue posting. I’ve already set out some goals for the summer, for my internship, professionally, and personally, and I’m excited to share those next time! 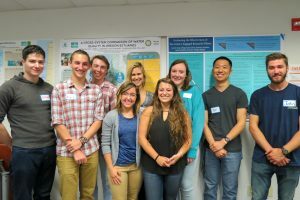 Today we kicked off our 2016 Summer Scholars season with an orientation for the 10 undergraduates who will be spending their summer working on research and public engagement projects with natural resource agencies on the Oregon coast: Angus Thies, Lexi Brewer, Skyler Elmstrom, Claire Mullaney, Erin Horkin, Stephanie Ng, Collin Williams, Edward Kim, Justin Dalaha and Jessica Vaccare. This is the largest class of Summer Scholars we’ve hosted to date, and we look forward to reading their posts about their experiences in our Sea Grant Scholars blog.